With over 20 years experience in the field, I provide clock repair in the Dallas Fort worth Metroplex. I specialize in Grandfather type mechanical clocks. Can also provide 'on location' battery clock repair. Honesty is Priority Number One when it comes to you, the customer. A repair could be as simple as an adjustment, saving you money when it comes to dealing with an honest person. Repairing clocks isn’t just about the clock, it is about the customer service that we offer.We go out of our way to make your experience with us a pleasant one. 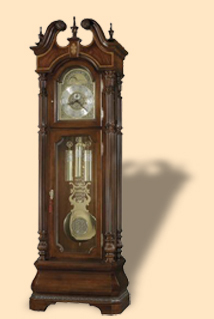 Found a used grandfather clock you want to buy ? I can inspect the clock you want to buy...set up and repair on it's new location,if needed. Copyright 2012: Clockmasters |Housecalls for Clock Repair | All rights reserved. Warranties given on big repairs. Excellent Record with the Better Business Bureau (BBB). Clock Repair - House calls - Serving Ellis County TX and surrounding cities: Waxahachie - Ennis - Red Oak - Ovilla - Cedar Hill - Mansfield - Midlothian -Desoto - Duncanville and more.